On April 10, at 21:41 information was received to “911” service that a car accident had occurred on Lanjik-Mastara roadway, there were casualties: the rescuers’ help was needed. 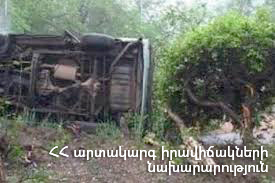 It turned out that “Mercedes E200” (driver H. H. born in 1975) car had run off the roadway and slid into a gorge about 4 m on the 80th km of Yerevan-Gyumri highway. Before the rescuers arrived at the scene the passengers (K. M. born in 1968, H. M. born in 1971) had been taken to the medical center of Talin. According to doctors the casualties were in serious condition.